* 6 points were award to Pakistan after India failed to play the three ICC Championship matches scheduled to be played between the two sides. THESE ARE NOT THE OFFICIAL FIXTURES !!!! All teams have at least a 3 day gap between matches (boy, does this not restrict the options!! ), play day, spare, travel. 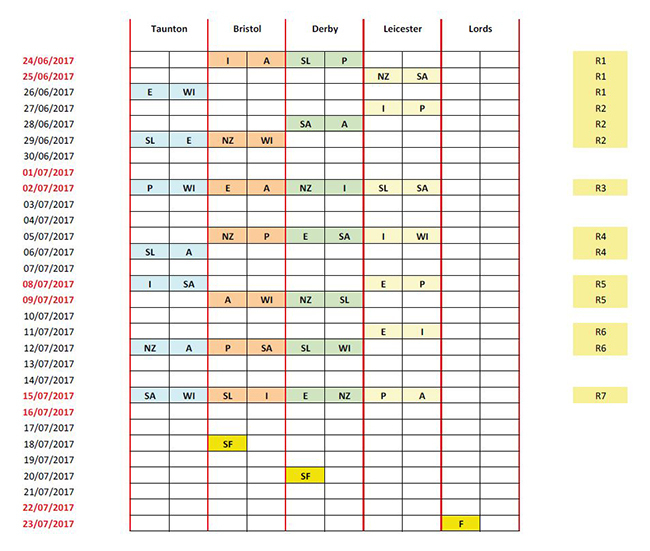 England matches are as evenly spread as possible with only Bristol (but they get Australia 3 times and a semi-final) having England once, others get them twice. Every host ground in this summer’s ICC Women’s World Cup will stage an England match within the schedule announced today by the England and Wales Cricket Board (ECB) and International Cricket Council (ICC). England will launch their home World Cup campaign against India in Derby on 24th June. Heather Knight’s side then visit Leicester to face Pakistan and Taunton to play Sri Lanka. They then head to Bristol to take on South Africa prior to facing off against rivals Australia on 9th July. England travel to Derby next to take on New Zealand on 12th July before finishing their round-robin fixtures against World T20 champions the West Indies on 15th July in Bristol. “We are incredibly excited to get the chance to play in front of home crowds at every World Cup ground. Our fans are the best in the world and we can’t wait to get out there and perform in front of them. Hopefully the next generation of England cricketers will also be there watching us. “We are delighted to be able to play at all four of the World Cup venues throughout this tournament and I hope that our cricket-loving public come out in full force to support us up and down the country.